The TIP is the agreed upon list of specific priority projects. The TIP lists all projects for which federal funds are anticipated, along with non-federally funded projects that are regionally significant. The TIP represents the transportation improvement priorities of the region and is required by federal law. The list is multi-modal; in addition to the more traditional highway and public transit projects, it includes bicycle, pedestrian, and freight related projects as well. It's a long dry document and is not on my summer reading list, but it enables us to follow the money and see how much is being spent on bicycle projects and how much is going toward widening our unbikeable intersections. 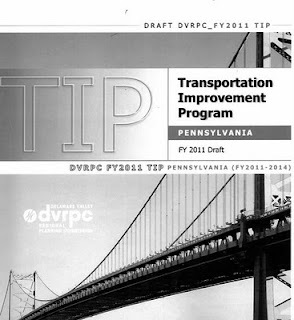 On behalf of the 1.5 million persons who ride bicycles in the Delaware Valley Region, we submit these comments on the 2011-2014 Pennsylvania Transportation Improvement Program (heretofore called, the TIP). Overall, we are disappointed that the TIP does do more to advance bicycle/pedestrian facilities and that it does not reflect an adherance to PA’s Complete Streets check list. We urge the DVRPC to address these two deficiencies in its final draft. 1. The 2011-2014 TIP does not adequately reflecting comprehensive compliance with federal and state Complete Streets policies. This is both a lost opportunity and a negative impact project. Two foot shoulders are totally inadequate. New turn lanes will squeeze out bicyclists and right turn lanes encourage drivers to not yield to pedestrians. This project needs pedestrian refuges, a stop phase for right turning vehicles when the pedestrian signal button is pushed for pedestrians and four foot shoulders plus bike pockets at intersections to the left of the right turn lane. A shoulder will be eliminated for an auxiliary lane, we disapprove of marked right turn-straight through lanes as they force cyclists to make difficult choices for proper lane position, less experienced cyclists will opt to stay to the far right, leaving them vulnerable to a right hook crash. While we applaud the addition of 5 foot shoulders, we are concerned that they will disappear at intersections with channelized turn lanes. Yellow Springs Road is a popular recreational bike route. We suggest left turn bike pockets on southbound 29 at Yellow Springs and straight through bike pockets at all intersections with right turn lanes. I-95 – Shackomaxon Street to Ann Street. There appears to be excess width on Delaware Avenue south of Girard. We recommend that more space be allocated to the bike lane to provide a buffer for cyclists. The intersection at Girard is very tricky, especially turning left from Delaware to Girard. We recommend a left turn pocket or bike box. There appears to be room for bike lanes on Girard from Delaware Ave over to the near Fletcher St and can be achieved by added bike lane markings in the shoulder and a bike left turn pocket at the Delaware Ave intersection and a green crossover bike lane at Ramp D.
Where the I-95 goes over Richmond Street, there needs to be adequate lighting and other measures to make the Richmond St. sidewalk safe and attractive. Montgomery and Delaware Counties have TIP projects that have road segments that are included in their respective bicycle plans but do not include any bicycle/pedestrian facilities. Some Delaware County road projects refer to the bicycle plan, but don’t include any facilities that would implement the plan. If road construction is not the right time to implement a bike plan, when is? Each road project should have been evaluated with the PennDOT check list and the County Bicycle Plan and the project description should indicate the results of that evaluation. Most of the streetscape projects in the TIP do not include provisions for bicycle parking. The TIP should more clearly describe how well the projects meet the requirements of the Pennsylvania’s Bicycle and Pedestrian Checklist. Although not a full blown Complete Streets policy, Pennsylvania’s bicycle and pedestrian checklist serves in its place and was issued by PennDOT almost ten years ago. The effectiveness of the checklist is impossible to measure on a project by project basis because the outcomes are not evaluated or listed in the project description. DVRPC should play a more pro-active role in ensuring that the check list was used to ensure that each project is “passed” the checklist as much as possible. We believe that DVRPC should have a Complete Streets policy itself, or some kind of set of principles that it uses to evaluate projects. For example, the Metropolitan Transportation Commission of California adopted Resolution 3765 in 2006, which is essentially a check list to determine if local jurisdictions considered complete streets principles. While DVRPC has good bicycle-pedestrian goals in its 2035 Connections Plan (p. 87-90), it is not a policy. We urge DVRPC to take the next step and adopt an enforceable and transparent complete streets policy that generates measurable results to track how transportation funding in the TIP is meeting the goals laid out in its plan. "The intersection at Girard is very tricky, especially turning left from Delaware to Girard. We recommend a left turn pocket or bike box." I am a little confused here. Delaware and Girard Ave do not intersect at this time nor will they intersect after the interchange is completed. Do you mean Richmond and Girard? "Where the I-95 goes over Richmond Street, there needs to be adequate lighting and other measures to make the Richmond St. sidewalk safe and attractive." This is already going to happen. Check out http://www.95revive.com/girard-avenue-interchange-alternatives.aspx for details. "There appears to be room for bike lanes on Girard from Delaware Ave over to the near Fletcher St and can be achieved by added bike lane markings in the shoulder and a bike left turn pocket at the Delaware Ave intersection and a green crossover bike lane at Ramp D."
There is only about 150 feet of road between Delaware Ave and Fletcher on Girard Ave. I suspect that you may be confusing Richmond St and Delaware Ave again. "There appears to be excess width on Delaware Avenue south of Girard. We recommend that more space be allocated to the bike lane to provide a buffer for cyclists." Again I suspect you are confusing Delaware Ave. and Richmond St.